WEATHERFORD, Texas--(BUSINESS WIRE)--In a historic industry move, Cummins, Inc., the world’s largest manufacturer of diesel engines, (NYSE:CMI) now officially endorses and recommends two Power Service products – Diesel Kleen +Cetane Boost and Diesel Fuel Supplement +Cetane Boost – for use in diesel engines. The announcement comes after significant internal testing concluded both products meet Cummins® requirements, becoming the first fuel additive products that Cummins Inc. has ever officially recommended in the marketplace. 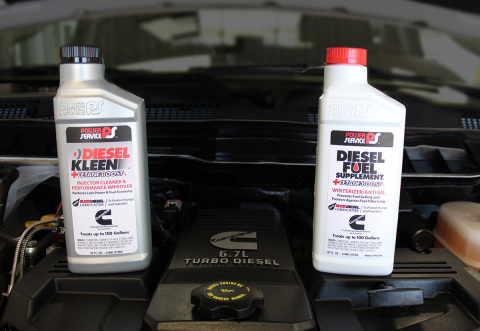 With the advancement of diesel engine technology and to fully realize the benefits of today’s cleaner burning fuels, using Power Service Diesel Kleen +Cetane Boost as a year-round performance enhancer cleans dirty injectors, prevents injector sticking, smooths rough-running engines and can improve fuel economy. This all translates into maximizing overall engine performance. Diesel Fuel Supplement +Cetane Boost, recommended for use in cold winter months when temperatures drop below +30F, is a winterizer/anti-gel used to prevent fuel gelling and keep fuel-filters from plugging with ice and wax. When temperatures drop, paraffin (wax) in Ultra-Low-Sulfur Diesel fuel (ULSD) will gel, stopping fuel from flowing through the engine and water in the fuel can freeze on the facings of fuel-filters, blocking fuel flow. This formula provides trouble-free winter operation for diesel fuel. “This partnership allows Cummins to leverage Power Service’s wide distribution network and industry leading technology to make diesel fuel solutions more accessible to our customers,” said Gary Ross, Director of Global Mining Business, Cummins Filtration. Power Service Products, a third-generation family, woman- and veteran-owned company, opened for business in 1956 in a small one-car garage and has since grown into one of the industry’s greatest success stories. The company’s research laboratory is a recognized leader in the development of a complete line of proprietary-formulated diesel fuel additives which are sold in highly concentrated formulations for large commercial operations and in retail packages available at truck stops and automotive retailers nationwide. For more information about Power Service, visit the company’s website at www.powerservice.com. Follow Power Service Products on Twitter at www.twitter.com/pspadditives and on Facebook at www.facebook.com/powerserviceproducts.